Centigrade provided event coordination and on-site support for McIntosh at the 2014 Amelia Island Concours d’Elegance. This was McIntosh’s second year appearing at The Concours with Centigrade and all activations were very successful. On the Thursday of the Concours, legendary McIntosh McAire’s were set up in select VIP suites within The Ritz-Carlton along with compliments cards and the opportunity for guests to book a private demonstration in the official McIntosh Sound Lounge. The McIntosh Sound Lounge ran from Friday – Sunday from 10am-5pm and was located just off of the main lobby of The Ritz-Carlton. The lounge included the McIntosh Soho Music System and was open to all event patrons to come and listen to music and enjoy complimentary refreshments while experiencing the high quality sound of the McIntosh equipment. 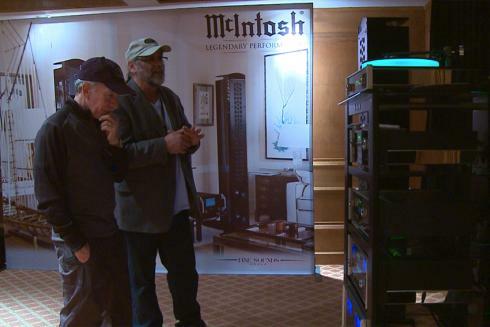 The McIntosh Reference Music System was set up in the ballroom area of the hotel for guests to enjoy as they explored the various vehicles and vendors appearing at this year’s Concours. The experience provided by McIntosh created a great atmosphere and encouraged guests to visit The Sound Lounge for a personal demonstration. The official, inaugural Concours After Party was hosted by McIntosh. The evening activation was attended by Mercedes Gala Dinner guests and the general public. The lobby of The Ritz-Carlton was transformed by the great collection of people enjoying drinks and cool music spun by DJ Mark Deaton playing through some of McIntosh’s most powerful equipment: The McIntosh Reference Music System. The Amelia Island Concours d’Elegance proved to be a great success for McIntosh with relationships galvanized among existing owners as well as new prospects. For photographs of the event check out our Facebook page.